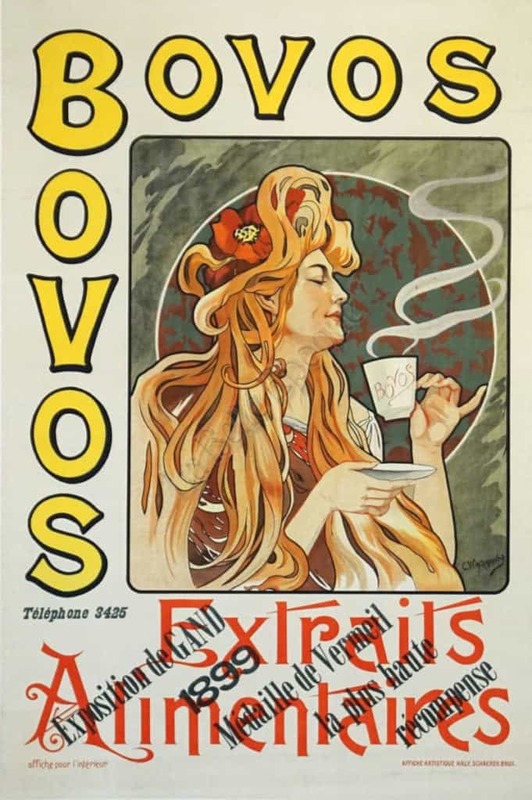 This poster is advertising Bevos, a bouillon of sorts (Extraits Alimentaires). Pictured is a Belle Epoque (Mucha-style) dressed lady drinking the award winning bouillon (1899 Medal of Vermeil). The woman has a flower in her hair. Lastly, the aroma of the Bevos is sifting above the cup. The name of the company is in Yellow, Red lettering on bottom. Also, on the bottom left, the poster is marked for ‘Indoor Use’ only.